Although he never competed against the best of his age at two, three, or four, St. Simon left such an impression on the race courses of England that he was hailed the champion of his crop, and one of the best of all time. 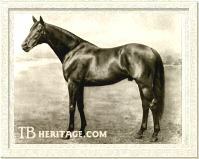 St. Simon, who ran undefeated and unmatched, managed to perform even more dynamically at stud; his progeny and their descendants dominating global racing at the turn of the 20th Century and for decades after. Galopin St. Simon was foaled in 1881 at William Barrow's Paddocks near Newmarket, the offspring of a stallion named Galopin and his mate, St. Angela, by King Tom. Galopin had been purchased as a yearling in 1873 by the Hungarian Prince Gustavus Batthyany from breeder William Blenkiron's Middle Park Stud. For Batthyany, he proved an outstanding runner and won 10 of 11 starts including the Derby Stakes. Not surprising, Galopin was a particular favorite of his owner, and because of this, the colt was retired to stud at four instead of making the customary run at the Ascot Gold Cup, to spare him any potential injury to shatter the Prince's dream. At the time of St. Simon's conception, Galopin was still an unproven commodity, in fact he didn't get his first good runner, the Guineas winner Galliard, until his fifth crop, three-year-olds when St. Simon came up for sale in 1883. St. Angela, on the other hand, appeared to be past her prime, if she ever had one. Despite being a daughter of King Tom (albeit a better broodmare sire than sire), and from the family of the good broodmare Rudstone and Derby winner The Little Wonder, St. Angela had been disappointing in all respects thus far. A minor winner of just one race and £70, she had no good runner to her credit, only the modest winner, Episcopus (1876). In 1879 she produced the filly Angelica (by Galopin), who was sold to the Duke of Westminster. Never raced, Angelica later produced the champion and important sire Orme (1889 by Ormonde), but that was well into the future. In 1881, at the age of 16, St. Angela gave birth to her sixth foal, a brown colt by Galopin. It's suspected that her lack of successful progeny is what prompted Prince Batthyany to forego nominating the 1881 Galopin colt to any of the classics except for the 2,000 Guineas. That nomination was voided by unfortunate circumstances in early May, 1883. Prince Batthyany was at the Newmarket races for the 2,000 Guineas. Known to have a faulty heart, the Prince collapsed and died following a coronary on the steps to the Jockey Club rooms. He did not live to see the colt Galliard, by his own Galopin, win the classic. Batthyany's horses were dispersed at the Tattersalls July Sale at Newmarket, including the racehorses, under the care of trainer John Dawson. It's very likely that Dawson knew what he had in the two-year-old St. Simon, since prospective buyers, first looking at the stable's star, three-year-old Fulmen (by Galopin - Lightning), discovered St. Angela's two-year-old son "fat as a bull" with both hocks suspiciously painted with a white substance. Two of the lookers were the young Duke of Portland and his trainer, Mat Dawson, brother to the self same John Dawson who had been training St. Simon. Portland's trainer examined the dressed hocks, and intimated that if he knew his brother, there was nothing the matter. It's presumed that the trainer was trying to pull a fast one and discourage buyers, perhaps with an interest in buying the colt himself. Being outbid on Fulmen, who sold for 5,000 guineas, Portland and Dawson had to go to only 1,600 guineas for St. Simon. Galopin brought 8,000 guineas at the same sale and was moved to Henry Chaplin's stud at Blankney to join the aging Hermit. The old mare, St. Angela, in foal to Galopin, brought just 320 guineas from Leopold de Rothschild who shipped her to France. St. Simon was moved to Matt Dawson's Heath House stables at Newmarket, the white paint scrubbed off, and the colt checked out perfectly sound. He would prove to be one of the greatest bargains of all time. William Cavendish-Bentinck (1857- 1943), then only 25 years old, had become the sixth Duke of Portland in 1879, and inherited the estate and stud at Welbeck Abbey, Nottinghamshire, where the fourth Duke of Portland had raised 1819 Derby winner Tiresias. The sixth Duke returned Welbeck to the high status it had achieved in the 1600s and 1700s as a source of great horses with several purchases in the early 1880s, including St. Simon. One of Portmore's first investments was five-year-old Mowerina (by Scottish Chief), a speedy racemare out of a full sister to the great West Australian, purchased for £1,400 from Lord Rossmore in 1881. Mowerina became the Duke's foundation mare and produced quite a brood, including his first good runner, the two-year-old filly champion Modwena (1883 by Galopin), as well as Donovan (1886), Semolina (1887), and Raeburn (1890). Portland also bred Ayrshire (1885), William the Third (1898), and Airs and Graces (1895). But in 1883, Portland was in the early stage of his breeding program, and what was to be his foundation stallion was still just a two-year-old. Although sound, St. Simon horrified his connections in his early training, displaying an odd hopping stride and lack of coordination. In retrospect, this was probably due to his unusual conformation, with an extremely short back, but when warmed, up, he moved forward with tremendous elasticity and power. In a five furlong trial which followed, St. Simon beat Clochette and Fleta with his chin pulled to his chest. He was then sent to the course at Derby, where, on August 31, he won the five furlong Devonshire Nursery Plate by two lengths "in a canter" against 19 rivals, with Trionfi and Archer second and third, giving them both at least 19 pounds, as he carried 124 pounds. He followed up with an effortless win at Doncaster in the seven furlong Princes of Wales's Nursery Plate, carrying 126 pounds (giving upwards of 44 pounds to his rivals) scoring by eight lengths against a field of 21 on September 13. Next on St. Simon's calendar was a match race scheduled for October 24 during the Houghton races at Newmarket, against the Duke of Westminster's colt named Duke of Richmond (a Hampton colt formerly known as "Bushey"). Both jockeys had instructions to "cut the beggar's throat from the start," but St. Simon was the one to draw first blood, and won the six furlong match by three-quarters of a length. The Galopin colt ended his juvenile campaign undefeated in five starts. Although he had not participated in any of the major two-year-old stakes, he was considered the best of his age. Since he wasn't entered in either the Derby or St. Leger, St. Simon's three-year-old campaign focused on some of the great cup races of the day. But before he could make his first official start of the season, he was tested in several significant trials on his home grounds at Newmarket. Early in the spring, with Fred Archer in the irons, St. Simon was working in a set with the other well regarded three-year-olds Harvester and Busybody, winners subsequently of 1,000 Guineas and Oaks (Busybody) and the Derby Stakes (Harvester, who had dead-heated with St. Gatien). As he was prone to do when not in peak condition, St. Simon didn't appear to be in the spirit of the thing, and Archer was instructed to nudge him with the spurs. St. Simon bolted and, as Portland related in his memoirs "we saw him shoot out, pass his own stable companions, tear up the gallop, dash through another trainer's lot of horses galloping in front, scatter them like pigeons before a fox and disappear from view." Archer was unable to pull him up until he reached the end of the gallops, and after which he made the famous exclamation "He's not a horse, he's a blooming steam-engine." St. Simon's next major piece of work was a public trial that had been arranged between him and Ascot Gold Cup winner Tristan, then a six-year-old, and the best older horse in training. Both horses had pacemakers, making it a set of four. Archer had been replaced by Charles Wood, who rode the brown colt to a six lengths trouncing of Tristan over a mile and a half. In Tristan's defense, the race had been run under something like weight-for-age conditions. He was carrying 135 pounds to St. Simon's 112, and he raced the next day, winning the Hardwicke Stakes in fine style. Shortening up to a mile in the Newcastle Gold Cup on June 26, only one dared to oppose him, and St. Simon beat Chiselhurst by eight lengths. The course was very hard and he came out of the race a little worse for wear, damage that was to have an impact further down the road. On July 20, St. Simon went to the post for the Goodwood Cup at two and a half miles and beat the previous year's St. Leger winner Ossian by 20 lengths. Prior to the St. Leger, which St. Simon was unable to contest, he was worked in a set with three other useful colts, and gave them a pounding, singlehandedly proving that the Triple Crown would have been his for the taking. The beaten colts were The Lambkin, who went on to win the St. Leger, Scot Free, who had won the 2,000 Guineas that season, and Harvester, who had dead-heated with the great St. Gatien in the Derby Stakes. But the Goodwood Cup proved to be St. Simon's last start of the season, and he had again proven unbeatable, this time in just four starts. He remained in training at four, but due to nagging leg problems resulting from his Newcastle Gold Cup victory, he never made it in front of the starter again. Unfortunately, he wasn't taken out of training until after the breeding season, so the world had to wait another year for the rest of his saga to begin. St. Simon retired with a flawless nine wins in nine starts over two seasons, and although he didn't race officially against the best of his age at two or three, he had proven himself one of the best stayers of the century. St. Simon matured to 16 hands (although some sources say 16.1), and he said to be so exquisitely made, that he appeared smaller than he really was. It was only in his fluid, elastic action that St. Simon took on a larger than life persona. His head was finely chiseled with a neatly dished profile, but no mistaking, he was a racing machine, with clean, tight legs, tremendous shoulders, and powerful hindquarters. The Bloodstock Breeders' Review of 1916 remarked "His shoulder was a study. So obliquely was it placed that it appeared to extend far into his back, making the latter look shorter - and as a matter of fact it was shorter..." St. Simon actually measured about three inches taller than he was long, even considering his high withers. In "Famous Running Horses," Wall gives his measurements as 16.1 hands, girth 78 inches, cannon bone 8 1/2 inches. He was also noticeably over at the knee, a characteristic obvious in most of the photos taken of him. Many of his offspring, especially his fillies were on the small side, although a few of his good colts were above average in height. His runners were typically on the leg with their sire's short back and close coupling. They were also often very highly strung, nervous, and difficult. With a small star above eye level on his forehead, St. Simon was a solid dark brown, although he also had a few grey hairs on the inside of his pasterns and heels in back. The famous portrait by Lynnwood Palmer shows the inside of his left hind coronet to be white. As a stallion St. Simon proved to be a pure dominant for bay or brown foals, with the exception of a single grey filly, his last foal. Although his temperament was otherwise good, St. Simon's overly excitable nature proved challenging. There were the horror stories, about St. Simon attacking grooms and killing well-intended barn cats, but this could be attributed to his edgy nature. St. Simon needed to be handled with care and patience, and above all, quiet skill. Trainer Dawson described him as having a certain "electricity" common to the Galopins, but heightened in his finest son, and this electricity was been passed down through his descendants, a highly strung, nervous, willful, but brilliant group. St. Simon was retired to stud at five in 1886, initially at the Heath Farm at Newmarket, owned by Matt Dawson. For the 1887 season, he was moved to the Duke of Portland's stud at Welbeck Abbey. In 1894 and 1895, due to major herd health problems, including a spate of mares slipping their foals, St. Simon stood at Rufford Abbey, also in Nottinghamshire, and returned to Welbeck after the estate had been completely renovated and sanitized. 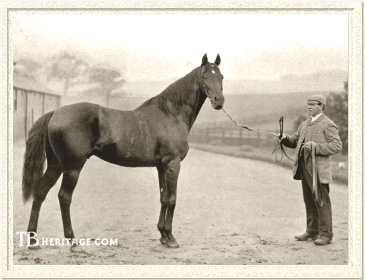 The mighty stallion reigned at Welbeck as the nation's leading sire from as early as 1890, when his first foals were just three-year-olds, and stayed on top as leading sire through 1896, and again in 1900 and 1901. 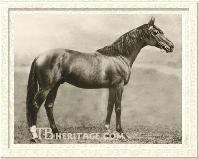 He was also the leading broodmare sire in Great Britain in 1903 to 1907, and again in 1916. St. Simon died from an apparent heart attack on April 2, 1908 shortly after his morning exercise at the age of 27. Wall notes in "Famous Running Horses" that he covered his last book of mares in 1907, "although still fertile in his last year," so why he wasn't breeding mares in 1908, even though he was said to be the picture of health, is a mystery. St. Simon was given a grave marker at Welbeck Abbey Stud, but there can't be much beneath it. His hide was preserved and for some time was on display in a vertical wood and glass case in the entrance hall at Welbeck. His skeleton was given to the British Museum of Natural History at South Kensington, London, although it is no longer on display. A gold mounted hoof is on display at the Jockey Club in Newmarket, and another pair are in the Racing Museum at York. In 1995, Lady Anne Bentinck had St. Simon's hide, along with those of fellow stallion alumni Donovan and Ayrshire, removed from Welbeck and given to Sir Mark Prescott, current trainer in residence at Heath House, where St. Simon trained. St. Simon was an immediate and profound success as a sire. His first crop, foals of 1887, included the champion two-year-old filly Signorina, Semolina, who won the 1,000 Guineas the following year; and the Oaks and St. Leger winner Memoir. Those three classic wins in 1890 sent St. Simon to the top of the sires' list for the first time and set the standard of excellence. Overall, his fillies, such as these, were slightly better than his colts, but the number of his outstanding progeny both on the track and as breeding animals is astounding. 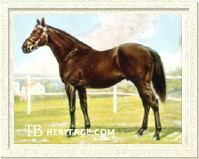 He sired tremendous class, particularly in regards to classic stamina, numbering among his offspring 10 winners of 17 English classics: a pair of Derby winers (Persimmon and brother Diamond Jubilee), five Oaks winners (Memoir, La Fleche, Mrs. Butterwick, Amiable, and La Roche), four winners of the St. Leger (Memoir, La Fleche, Persimmon, and Diamond Jubilee), a pair of Guineas winners (St. Frusquin and Diamond Jubilee),and a quartet of 1,000 Guineas winners (Semolina, La Fleche, Amiable, and Winifreda). He also sired a trio of Ascot Gold Cup winners (Persimmon, William the Third, and La Fleche). St. Simon passed on his brilliant acceleration, which enabled him to sire a large number of precocious two-year-olds. This, combined with his own superior conformation and stride, also allowed many of those to improve off their juvenile form into even better runners at three at four, as the distances drew out. His greatest runner was probably "the peerless LA FLECHE," a brown, lightly made filly born in 1889 out of the mare Quiver by Toxophilite. Bred at Hampton Court, she was sold as a yearling, and due to the exploits of her full sister, Memoir (b.f. 1887), winner of that year's Epsom Oaks, the St. Simon - Quiver filly brought a new record price of 5,500 guineas, purchased on behalf of Baron Hirsch. La Fleche was undefeated at two in four starts, and at three won eight races including the 1,000 Guineas, Oaks, and St. Leger Stakes, and was second to longshot Sir Hugo in the Derby. A stakes winner at four, she won the Ascot Gold Cup and Champion Stakes at five. La Fleche became a successful broodmare, the most important of her foals being John O' Gaunt (1901 by Isinglass), the sire of Swynford and Kennymore. 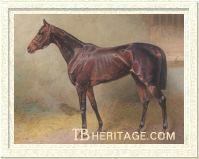 La Fleche died at Sledmere Stud in 1916. La Fleche's sister MEMOIR (b.f. 1887) had been one of the best juvenile fillies of her year, behind the division champion Signorina (also by St. Simon). She won half of her six starts that year including the Zetland Plate, Prendergast Stakes, and Bradford Plate. At three, Memoir was outstanding, winning the Epsom Oaks, St. Leger Stakes (defeating Blue Green), Newmarket Oaks, Newmarket Stakes and Nassau Stakes. She was also second in the 1,000 Guineas (to Semolina), Prince of Wales's Stakes and Champion Stakes. Like her sister, Memoir also proved an influential broodmare, dam of The Scribe, but her fame lay in the development of a strong female line through her daughter Miss Gunning (by Carbine). Memoir died in 1908 and is buried at Welbeck. Bred by E. Ginistrelli, SIGNORINA (b.f. 1887 out of Star of Portici by Heir-at-Law) was the champion at two over Memoir and yet another St. Simon filly, Semolina. Signorina won all of her nine starts at two including the Middle Park Stakes and Lancashire Plate. She was second to Memoir in the Oaks at three, and at four, won the Lancashire Plate. As a broodmare, she produced only three foals, but they included the great filly Signorinetta (by Charleureux) who won the Derby and Oaks; and the good colt Signorino (second in the 2,000 Guineas, third in the Derby; and a leading sire in Italy ten times). SEMOLINA (b.f. 1887 out of Mowerina by Scottish Chief) was bred by the Duke of Portland. Very small (15 hands) but powerful, she won 13 of 15 starts at two, including the Prince of Wales's S., Boscawen Stakes, Biennial Stakes, and walked over for the Municipal Stakes at Doncaster. At three she beat Memoir in the 1,000 Guineas, second in the Coronation Stakes and third in the Park Hill Stakes. 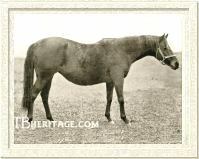 She produced little of influence as a broodmare, dying in 1909, and buried at Welbeck. St. Frusquin St. Simon's greatest son was PERSIMMON (b.c. 1893 out of Perdita II by Hampton), bred by the Prince of Wales (later King Edward VII). Persimmon won seven of nine starts, including the Derby Stakes (beating another St. Simon son, St. Frusquin), St. Leger, and Jockey Club Stakes. At four, he started only twice but was undefeated, in the Ascot Gold Cup and Eclipse Stakes. Persimmon, a great favorite of the Prince's, retired to the Royal Stud at Sandringham where he was a terrific success -- the leading sire in 1902, 1906, 1908, and 1912. His best runners included Keystone II (Oaks), Your Majesty (St. Leger), Prince Palatine, Sceptre, Ouaidi Haifa (French 2,000 Guineas), and Zinfandel. Prince Palatine carried on the male line (to Rose Prince and his son Prince Rose) before his export to America. Your Majesty and Perrier became important sires in Argentina. Comedy King was a two-time leading sire in Australia. Persimmon's son Out of Reach sired Kentucky Derby winner George Smith. Another son, Sea King sired Kentucky Derby winner Paul Jones. 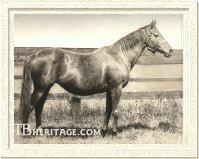 , Persimmon was also the leading broodmare sire in Great Britain in 1914, 1915, and 1919. Persimmon died prematurely in February 1908 after attempts failed to save him following an accident in which he broke his pelvis. His mounted head is on display at the Racing Museum in Newmarket. Persimmon's contemporary, ST. FRUSQUIN (br.c. 1893 out of Isabel by Plebian), was the best two-year-old of his year. Bred by Leopold de Rothschild, at three, he was second only to Persimmon with victories in the 2,000 Guineas, Eclipse Stakes, and Princess of Wales' Stakes, as well as second to Persimmon in the Derby. He broke down in both front suspensories prepping for the St. Leger and retired to a very successful stud career. 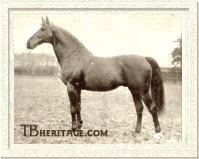 St. Frusquin was the leading sire in 1903 and 1907. Having more speed and less stamina than Persimmon, St. Frusquin's influence as a sire reflected that. He sired three 1,000 Guineas winners (Flair, Rhodora, Quintessence), as well as 2,000 Guineas/Derby winner St. Amant, and Oaks winner Rosedrop (dam of Gainsborough). 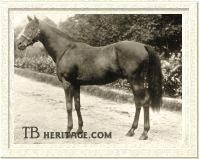 St. Frusquin died in 1914 at Southcourt Stud. Roquebrune Persimmon's older full brother, FLORIZEL II (br.c. 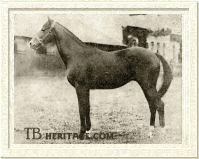 1891) was a tall, later-maturing stayer. He was placed in a stakes at two, and at three won the St. James's Palace Stakes and four other races. He bloomed at four into a top class stayer, winning the Goodwood Cup, Ascot Gold Vase, Manchester Cup, and Jockey Club Cup. He retired to stud at Sandringham, and got the classicists Volodyovski (Derby), Doricles (St. Leger), Royal Arch (Irish Derby), and Vedas (2,000 Guineas). His most important daughter, Gemma, produced the French runner and sire Sardanapale. Persimmon's full brother, DIAMOND JUBILEE (b.c. 1897) was also a product of the Royal Stud at Sandringham, Norfolk. His name reflected the 60th anniversary of the crowning of his breeder's mother, Queen Victoria, who actually frowned on her son's interest in the rakish sport of horse racing. Diamond Jubilee was not quite the pet as his older brother, in fact was one of the most nervous and dangerous of St. Simon's offspring. Only his groom, Herbert Jones, could ride him, and things culminated in an order of castration, which had to be revoked when it was discovered that he was a ridgeling. In spite of his temperament problems, Diamond Jubilee swept through the 1890 Triple Crown, and retired to stud at Sandringham. 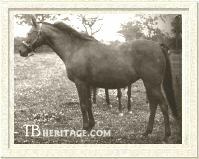 In 1906, he was sold to stand at Haras Las Ortigas in Argentina, where he became a leading sire in 1914, 1915, 1916, and 1921. He sired little of importance in England outside of the mare Taormina (dam of the German Oaks winner Tulipan, and stakes winner Traumer, a sire in the U.S.). In Argentina, he sired classic winners Smasher, As de Espadas, Moloch, and Dalmacia. Diamond Jubilee died in 1923. St. Simon's son WILLIAM THE THIRD (b.c. 1898 out of Gravity by Wisdom) was one of the best stayers of his era. Bred by the Duke of Portland, he took a while to come into his own and made only one start at two, and was unplaced. At three, however, he won five of seven races including the Newmarket Stakes and a walk over in the September Stakes, and was second in the Derby. At four, he won five of six starts including the Ascot Gold Cup, Doncaster Cup, Alexandra Plate, Limekiln Stakes, and walked over in the Lowther Stakes. Retired to stud at Welbeck, William the Third was very successful, getting Willonyx (Ascot Gold Cup), Winkipop (1,000 Guineas), Ronde de Nuit (French 1,000 Guineas), and Rembrandt (Italian Derby). He also sired the important mares Third Trick, Bill and Coo, Rectify, Trimestral, Dutch Mary, and the stallions Sandal and Nassovian. William the Third was an extremely well made horse but outside of aptitude, one of the less typical sons of St. Simon, being a big, lengthy horse, and extremely docile. He died in February of 1917 and is buried at Welbeck. 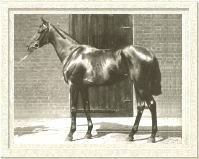 William the Third was the Leading Broodmare Sire in 1922. William the Third's dam Gravity was a sister to the mare Tact, whose daughter AMIABLE (b.f. 1891 out of Tact by Wisdom) was one of St. Simon's multiple classic winners. Also bred by Portland, Amiable was a good runner at two. At three she won the 1,000 Guineas and Epsom Oaks in 1894, and was third in the Park Hill Stakes. Ulbrich notes "She had a very bad string-halt in her hind legs - but it certinaly did not stop her galloping!" She left no legacy as a broodmare. Amiable died in 1915 and is buried at Welbeck. Amiable's sister, Yorkshire Oaks winner CHARM (b.f. 1888), was enough broodmare for both of them, dam of Goodwood Cup winner Red Robe, also Fascination, Captivation, and Assagai, the latter a sire in the U.S.
St. Simon's daughter MRS BUTTERWICK (b.f. 1890 out of Miss Middlewick by Scottish Chief) was another of Portland's homebred classic winners, although her only major win was in the Epsom Oaks. She produced the colts Phaleron and Greatorex, the latter, a ten-time leading sire in South Africa. Mrs. Butterwick's daughters, particularly Abbazzia, Buttermere, and Tomassina, bred on with success. LA ROCHE (b.f. 1897 out of Miss Mildred by Melton) was the outstanding filly of her age in 1890, winning the Epsom Oaks, Yorkshire Oaks, Newmarket Oaks, and Manchester Cup. Bred by the Duke of Portland, she returned to Welbeck to pursue her stud career as dam of Cannobie (sire in France) and Almissa (stakes iwnner in Australia). She died at Welbeck in 1920. RABELAIS (b.c. 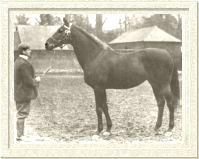 1900 out of Satirical by Satiety) was from one of St. Simon's later crops, and although a good stakes winner, was short of top class. Bred by Arthur James (Coton House Stud), showed excellent form at two, winning the National Breeders' Produce Stakes, Prince of Wales' Stakes, and Triennial Stakes among his four wins from five starts. At three, he could only win twice, in the Triennial Stakes, and Goodwood Cup. He was also third in the 2,000 Guineas to Rock Sand and Flotsam. 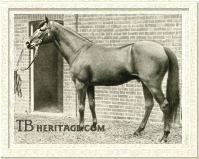 Sent to stud at Haras de Montford in France, Rabelais became the leading sire in that country in 1909, 1919, and 1926. His get include Durbar II (Derby), Ramus (French Derby), Biribi (Prix de l'Arc de Triomphe), Verdun (Grand Prix de Paris, French 2,000 Guineas), as well as Havresac II (leading sire in Italy), Rialto, Rire Aux Larmes,and Jacobi. His good producing daughters include Medora II, Reine Mab, Balance, and Liesuse. A small horse with bad hind legs, he had more white markings than most of the St. Simons and tended to pass on white markings as well. In November of 1928 at the age of 28, Rabelais' owner authorized that his great stallion undergo an experimental procedure known as "gland grafting" to graft testicular tissue onto his existing parts. Unfortunately, Rabelais died two days after the surgery, from pulmonary congestion. His male line survives through Havresac II down to Tenerani and his son Ribot; and a second line from Rabelais son Rialto to his son Wild Risk, who sired Le Fabuleux, Worden, and Vimy. Lord Derby bred CHAUCER (br.c. 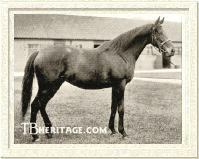 1900) from his outstanding mare Canterbury Pilgrim by Tristan (the mare would later produce another top sire in Swynford). Chaucer won the Gimcrack Stakes and Boscawen Stakes at two but could not regain that good form. Unplaced in all his starts at three, at four he won three plates, and at five won the Doncaster Spring Handicap and Liverpool Cup. At six he returned to win the Liverpool Cup again and placed in several stakes but bowed a tendon and was retired to Lord Derby's Woodland Stud at Newmarket. 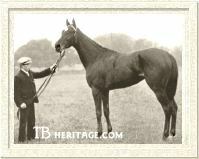 Another of the many small horses sired by St. Simon, Chaucer was better at stud than he was on the track, siring Stedfast, Prince Chimay, Canyon (1,000 Guineas), Pillion (1,000 Guineas), Forerunner, Scapa Flow, and Poet's Star. Chaucer was destroyed on February 4, 1926 following a seizure that left him paralyzed. Chaucer's male line continues through Prince Chimay's son Vatout, to Bois Roussel. His daughters became a tremendous force at the Derby stud and included Selene (dam of Hyperion, Sickle, Pharamond II, etc. ), Scapa Flow (dam of Pharos, Fairway, Fair Isle), Canyon (dam of Colorado, Caerleon), and Poet's Star. 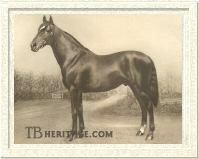 He was the leading broodmare sire in Great Britain in 1927 and 1933. DESMOND (blk. or br. 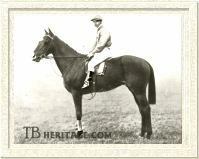 c. 1896 out of L'Abbesse de Jouarre by Trappist) was bred by Lord Dunraven and was the last of three foals produced by his Oaks-winning dam. He only won three races, and those were as a two-year-old, including the July Stakes and Coventry Stakes. He was never better than fifth at three, and was duly retired to Dunraven's Fort Union Stud in Ireland for the next season. He was the Leading Sire in 1913 when his sons Aboyeur and Craganour were classic contenders. In that year's Derby, Aboyeur was pulled down by a suffragette and Craganour finished first in a four-horse blanket finish, only to have his number taken down, having interfered with Day Comet. Craganour became a good sire in Argentina, Aboyeur was sent to Russia, and disappeared during the Russian Revolution. Desmond also sired Hapsburg, Charles O'Malley (dam's sire of Blenheim II), Limond, Stornoway, The White Knight, Farasi, Lomond, Earla Mor, and the mares Grand Geraldine (dam of Grand Parade) and Molly Desmond (dam of Spike Island, Molly Adare). Desmond died in 1913. Desmond's older sister FESTA (br.f. 1893) was a winner of two races and placed in minor stakes in England. 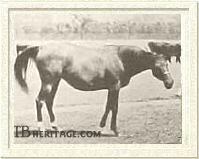 She was sent to Germany in 1901 after being bred to Ayrshire and there foaled Festino, winner of the Grosser Preis von Berlin, Union Rennen, and Grosser Hansa Preis. She next produced Fels (German Derby, Grosser Preis von Berlin, etc. 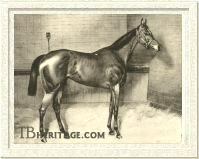 ), Fervor (Grosser Preis von Berlin, Deutsches St. Leger, etc. ), and other major winners Fabula and Faust. Festa is considered one of the most important mares in the German Stud Book. RAEBURN (b.c. 1890 out of Mowerina by Scottish Chief), is noted for being the only horse to beat the mighty Isinglass, which he did in the Lancashire Plate. He was also third in the Epsom Derby. He was sent to Hungary after two season at stud in England. St. Simon's other good sons included SIMONIAN (b.c. 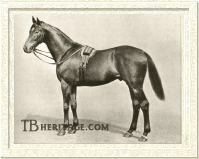 1888 out of Garonne by Silvio), a leading sire in France two times; PIETERMARITZBURG (b.c. 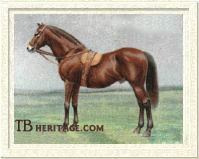 1898 out of Sea air by Isonomy), a leading sire in Argentina; ST. SERF (br.c. 1887 out of Feronia by Thormanby); BILL OF PORTLAND (c. 1890 out of Electric Light by Sterling), an important sire in Australia, sire of Leading Sire Maltster; also CHILDWICK (sire of Negofol) and ST. FLORIAN (sire of Ard Patrick). One Thousand Guineas winner Winifreda Besides those daughters of St. Simon already discussed, his good producing daughters included SIMONATH (dam of Flamboyant and granddam of Papyrus), GLACIER (dam of Toboggan, Silurian), SIBERIA (dam of Snow Marten), CHEERY (dam of Bromus, and granddam of Phalaris), ROQUEBRUNE (dam of Rock Sand), CONCERTINA (dam of Plucky Liege and Garron Lass), SANTA BRIGIDA (dam of Bridge of Canny, Bridge of Earn, Santa Cruz, etc. ), ONDULEE (dam of Frizette, Marathon), SIMENA (dam of His Majesty, Galloping Simon, Simone, etc. ), ST. MILDRED (dam of Knight Errant, Helmet, Cowl), LADY FRIVOLES (Dam of Lady Hamburg II, Tippety Witchet), and numerous others. St. Simon's excellence of conformation, brilliant speed, and tremendous stamina upgraded everything he was crossed with. His influence on the breed through his many important sons and daughters all around the globe led to this bloodline to become one of the most widespread and omnipresent in the Thoroughbred gene pool today.